When I spoke to Peter Hertzmann about Just Mayo, we talked a bit about the nature of mayonnaise. Now, here’s more, prompted by an article by Ari LeVaux (who told me a while ago why frozen beef is best). Take a quick look at the picture above. Do the two sets of packaging look similar? I think they do. Certainly more similar than either of them is to Just Mayo’s jar. So here’s the question: if you were in a hurry, and looking for “real” mayonnaise, which would you pick up? Brown Just Mayo, or one of the blue-branded jars above? The jars above left are from a company called Follow Your Heart, which produces a range of vegan foods, including one called Vegenaise. To me, the package looks like Hellman’s mayonnaise. Even though it doesn’t claim to be mayonnaise, I’d assume it was. And yet, as far as I can tell, Vegenaise has had no trouble from the American Egg Board, the USDA, the FDA or Unilever, which own Best Foods, maker of Hellman’s mayonnaise. That may be because, unlike Just Mayo, it is targeting vegans, and nobody much cares what they buy. But it makes a much more important point: there’s no big deal about the egg in mayonnaise, no matter what the FDA and its rules may say. The egg yolk is there purely to stabilise the emulsion of oil and water. In fact, there’s so little of it that all three — Hellman’s, Vegenaise and Just Mayo — record 0% protein on their nutrition labels. The emulsifier is important, no doubt about that, but the exact chemical nature or source of that emulsifier is, to all intents and purposes, irrelevant. So, why the fuss? Because of that definition of mayonnaise, I suppose. But the definition is completely past its sell-by date. It needs to change. And then maybe Vegenaise could change its name too and appeal to everyone who would rather not depend on the cheapest products of the chicken industry. 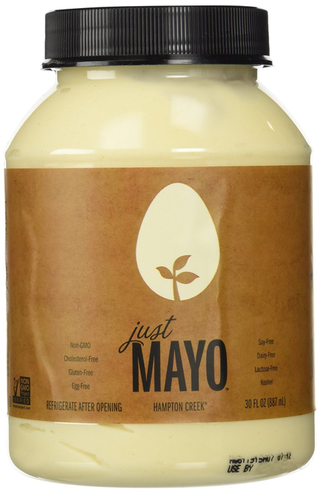 “The term ‘mayo’ should not now be held to the regulatory standard for ‘mayonnaise,’” wrote the company’s lawyer, Josh Schiller. So yes, they’re guilty, bang to rights, of making a product that isn’t mayonnaise. But the fuddy-duddy old FDA is guilty of confusing “mayo” with “mayonnaise”. To which, I think, Vegenaise has countered with a neat little tag-line “It’s Better than Mayo”. I can’t swear to it, but I don’t think that was there when I first started looking at the stuff. It’s fun watching this play out. I’ll stick to my whizzed concoction of tahini, yoghurt and lemon juice. The fuss about Hampton Creek's eggless oil emulsion has obscured other eggless players ... and the real point.